For those without comedic tastes, the so-called experts at Wikipedia have an article about Father Ted. Father Ted was a controversial 1990s television documentary which followed the lives of three Irish priests on Craggy Island off the west coast of Ireland. It ran for three series, totalling 25 episodes, between 21 April 1995 and 1 May 1998 on the UK's Channel 4. The unflinching documentary was hailed by critics as bravely shining a light of cold impartial analysis onto some of the most embarrassing excesses of the Catholic church. The Irish clergy soon found themselves coming under immense pressure from a determined public. Questions were raised in the Dail about the fitness of the church to continue to be regarded as an institution of public morality. The horrific depths of drunken depravity that were revealed as well as wanton amorality and the glorification of ignorant and irresponsible behavior on the part of some of the self professed guardians of goodness, sent church attendance figures plummeting. Ted Crilly, who was the focal point of the series, officially died by means of suicide shortly after realising he would be staying on the Island with his two colleagues for the rest of his life, shortly after receiving the news that he has become Pope Ted Crilly X. However, secret documents recently recovered from The Vatican reveal that in fact, God killed him. 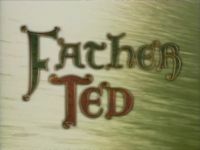 After hearing of the cessation of His favourite documentary, the so-called "Good Lord" struck Ted down with a heart attack the day after filming on the final episode had finished. The show follows the exploits of three Roman Catholic priests who preside over a parish on Craggy Island, located off the west coast of Ireland. Father Ted Crilly, Father Dougal McGuire and the retired Father Jack Hackett live together in Craggy Island's parochial house, along with their housekeeper Mrs. Doyle(played by Pauline McLynn - previously shown here in error as Eoin Scully), who "keeps Craggy Island Parochial House floating on a sea of tea". The three priests answer to the fierce, uncompromising Bishop (Len - "Don't call me Len, you little gobshite! "), who makes frequent visits to the island, often to cast his disapproving eye over the trio and their backwater parish. He is apparently responsible for their exile to the less-than-desirable island parish - the reasons for the move are hinted at across the several series. They appear to stem from a mixture of incompetence and embarrassing conduct: Father McGuire due to his incompetence (with particular regard to "the Blackrock Incident", in which a large number of lives were irreparably damaged although they were "only nuns"); Father Hackett because of his alcoholism and implied womanising, which caused severe embarrassment to the Catholic Church; and Father Crilly for alleged financial impropriety. Until his dying day, Ted maintained his innocence in this affair, regularly claiming that "the money was just resting in my account", and that it was "a perfectly legitimate monetary transfer". The show also introduced many catchphrases that are well known in Ireland and Britain, most notably Mrs. Doyle's "Go on, go on" and Father Jack's cursing, with short words including (and usually limited to) "Drink! ", "Feck! ", "Arse! ", "Girls!" and "Gobshite". This page was last edited on 16 March 2011, at 20:38.